Nissan's MX-5 Miata rival back in the plans? Nissan's on-again, off-again MX-5 Miata rival is... on again, at least according to the blokes at Auto Express. What form a potential two-door sporty coupe from Nissan may take – if it happens at all – is still widely debatable; it could be as simple as a cut-down Sentra or as crazy as a sporty take on the all-electric Leaf. Did that last little tidbit catch you off guard? 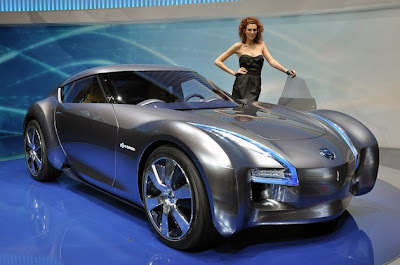 Remember that Nissan showed off just such a machine in the form of the Esflow Concept at the 2011 Geneva Motor Show, though we wouldn't expect any potential production model to share much with that highly conceptual design. In any case, Auto Express seems to think this sporty 2+2 may ride on a midsize platform sourced from Mercedes-Benz (the two automakers signed a partnership in 2010) that would be shared with whatever replaces the 370Z (along with its Infiniti G Coupe) and even the next-generation GT-R.
Another bit of wackiness? AE says Nissan is considering turning to the experts at Lotus for help in tuning the chassis for added sportiness. We suppose all of this is possible, but for now, we're taking it with the largest grain of salt we can get our hands on.